As the new year starts with its parade of faster tablets, thinner televisions, and self-parking cars, it may be time for a courteous nod to those who cling to their rotary phones, radios, and stick shifts—the Luddites. Assuming this word’s origin is not apocryphal, poor dim-witted and unwitting Ned Ludd has had his name co-opted by protesting textile workers in the nineteenth century and branded on technology skeptics in the twentieth and twenty-first—all because he had one extraordinarily bad day at the office. 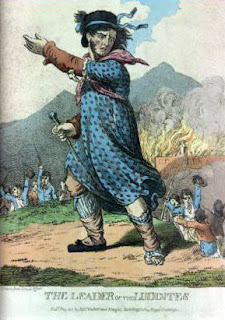 Ludd is believed to have lived outside of Leicester in central England in the late 1770s. He was a weaver and, if the legend is true, a bit of a simpleton. One day, in a fit of blind rage (and for motives unknown) Ludd apparently smashed two mechanical knitting machines. These “stocking frames” emulated hand-knitting and were precursors of the large-scale textile machines that would eventually lower the wages and replace the jobs of thousands of British workers over the next half-century. In the decades that followed, whenever a piece of equipment was damaged (deliberately or otherwise), British workers would claim that Ned Ludd had done it. The gritty and dehumanizing Industrial Revolution in the United States was presaged 100 years earlier in England. Both living and working conditions for laborers declined as technologies were introduced to reduce the need for skilled artisans. Unskilled workers were paid pittance wages to operate new machines, and resentment reached a fever pitch in the early nineteenth century when scattered acts of equipment sabotage gave way to full-scale riots between 1811 and 1816. Starting in Nottingham and eventually spreading all over England, masked workers conducted midnight raids on English factories and systematically wrecked the enormous automated looms that were replacing handicraft and directly threatening their livelihoods. These disaffected and destructive laborers, many of whom were now unemployed, called themselves Luddites in homage to knitter-knocker Ned. Luddites started warning factory owners that their (imaginary) leader “King Ludd” would take care of their equipment if they did not remove it themselves, and the riots became increasingly violent. Wooden debris was thrown from factory windows to burn in the streets. One factory owner was murdered after calling upon soldiers to fire on a protesting mob, killing one of the Luddites. 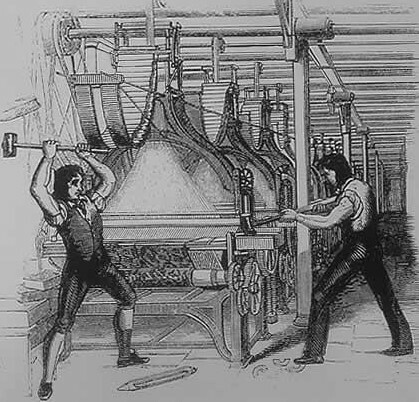 “Machine breaking” became a capital crime in 1812, and dozens of captured protesters were hanged or shipped to prison colonies in Australia over the next several months. 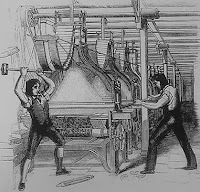 The Luddite movement was ultimately quieted by 1817 without having been able to effect any real change in working conditions.